The signing of Gianluca Lapadula this week seems to have taken everyone by surprise. And perhaps no one is more surprised than Pescara, who were pursuing a deal with Napoli for the 26 year old Serie B top scorer while entertaining offers from Juve, Sassuolo, and more. With Berlusconi in the hospital after having heart surgery and surrounded by young nurses, he was undoubtedly seeing more action than Milan’s transfer plans… or so we thought. We were all lying around scrolling past the very occasional rumor and waiting for news of a new coach or new owners. Meanwhile, The Condor swept in and grabbed Lapadula with his gnarled talons and snatched him out of the hands of our rivals. So what does this mean? Was this stage one of an actual plan for this summer? Or simply a warning shot to our rivals and others that somehow Berlusconi and Galliani are still breathing and not to be trifled with? Did the Condor strike? Or is this still a sinking ship? It’s hard to believe that Milan have a plan. Considering that virtually everything they’ve done in the past four years not only was a disaster, but a disaster in the worst possible ways. Like even if their plan was to destroy the club and take down it’s value and eventually entertain offers to sell it at much less than it was worth four years ago, even that was done poorly. No, the way they’ve behaved and managed the club was worse than an unruly teenager with a developing drug habit. They might be the only ones who still believe there was an actual plan for changing out 70+ players, 5 coaches, and the hearts and loyalty of all Milan fans in only four years. Of course, if you believe that Berlusconi’s plan was to take the club back down to where it was when he bought it, then purchasing a Serie B star for €9m in three installments makes almost as much sense as purchasing Alessandro Matri from a rival for €4m over four years’ time. But this player is different. His career has been on a definite upswing for the past three years, and he is only 26 years old. He signed, he passed his medicals. So far, so good. Perhaps the most confusing part of it all was that he was in such high demand. After being released by Juventus as a youth player because he couldn’t keep up with his studies, he climbed up the ranks of the lower divisions slowly until that same club wanted to sign him for their bazillion Scudetti-winning senior team. As did Napoli, Sassuolo, and Premier League title winners Leicester. He could have gone to almost any team, and yet now he’s a Milan player. A Milan player at a time when who will coach or even own the team next week is completely uncertain. So was this a plan? That’s so very hard to believe. Or was it one of Galliani’s last stands? A deal to try to prove everyone wrong who believes that he’s completely lost it? Was it his way of leaving his mark on the club? Or his way of proving his worth to potential new owners and trying to save his job? These possibilities are far more likely, but unfortunately, proving them rests squarely on the shoulders of a 26 year old striker who has never played a Serie A match. 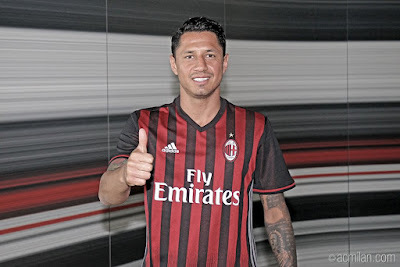 A striker who is coming into Milan on the heels of dozens of other players who were more successful and more experienced. (Yes, even you, Matri. Now go back into your hole and don’t come out until Milan have finally paid you off.) Even if ex-Milan player and now Pescara coach Massimo Oddo may have tipped off the old buzzard and influenced the player’s choice, you’ve got to admit it feels great to beat those other teams to a player in demand. This signing could also symbolize more things to come. Was it an awakening of activity at Milan ahead of whatever changes (or not) that should be on the horizon this summer? Like the reports from Mediaset that Milan will name their coach on July 1st. Not that this should be a surprise, given that Brocchi’s contract should be up right about then, and they’ve got to extend him or have a new coach by the time the players return to Milanello the following week. There are more rumors that a deal for the sale of the club will be announced July 7th, but having lived through the Mr. Bee saga, we should all know not to trust a Milan deadline. Still, something’s got to give. Was this a sign that things are finally moving? Most likely, this was a singular warning shot. 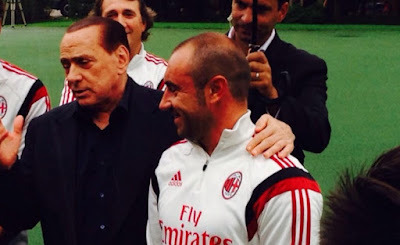 Whether it was an attempt to prove Galliani’s worth to rival clubs, to himself, to Berlusconi, to fans, or one last chance to cover up the Matri debacle, it’s very difficult to see this as a piece to a larger puzzle. Unless, of course, that puzzle is Berlusconi’s all-Italian dream team. But let’s not go there. 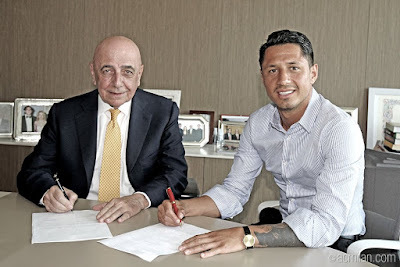 It would be nice to think that for once, Galliani did something right again. Like when we hijacked Bonaventura from Inter. But how this deal will be remembered will depend on time and the performance of a much-wanted player. And for now, I’m going to hope that our rivals take it as a warning shot, fired from the bow of what appeared to be a sinking ship. Or at least that’s what Galliani will surely be telling himself.